The dining room and outdoor patio of Girasol, designed by Gulla Jonsdottir, complements the locally sourced menu by Chef CJ Jacobson. Another Top Chef alum has arrived in the 818 (a group which already includes Fabio Viviani/Firenze Osteria in North Hollywood, Alex Eusebio/ Sweetsalt in Toluca Lake, and Antonia Lafaso who created the menu at Black Market Liquor Bar). The latest is CJ Jacobson (season 3 and 10), who opened the much anticipated Girasol in Studio City yesterday. It replaced the former 8 1/2 Taverna which was left abandoned two years ago. Girasol, which means ‘sunflower’ in Spanish (check out the ceiling in the above photo), features a rustic-refined take on California cuisine with an emphasis on the use of fresh herbs. “To me, California cuisine has Mexican roots, ties to the Pacific, and is most importantly representative of what’s fresh,” says Jacobson. “At Girasol, we want to create a neighborhood-friendly dining destination where guests can experience familiar ingredients in a unique manner.” He says he is inspired daily from what’s available at farmer’s markets — and choice farms. The menu features a selection of bar snacks, shared small plates, entrées, and sides to enjoy family-style at the casual bar, open patio, or intimate dining room. The current offerings include Apricots and Burrata Cheese, Octopus Salad with long roasted eggplant; as well as entrées such as Whole Fried Red Snapper; vegan Pan Roasted Cauliflower served with grilled oyster mushroom, lentils, satsuma, and almond cauliflower purée; Braised Leg of Lamb with carrot purée, crispy brussels sprouts, Rainer cherries, fried potato, and dill flower. Desserts include Dark Chocolate Chiboust with crème fraîche gelato and salted chocolate sable, as well as Buttermilk Donuts with strawberry sauce and pistachio purée. Girasol is located at 11334 Moorpark Street, Studio City. Open for dinner daily from 5 – 10 p.m. (Monday – Wednesday) and 5 p.m. – 12 a.m. (Thursday – Saturday). There’s currently an interesting wine list, but the cocktail program (and a weekend brunch) will also be introduced later this year. Reservations can be made by calling (818) 924-2323 and walk-ins are welcome. For more information, visit www.GirasolRestaurant.com or Facebook. 4th of July Special: Nesmon Cafe in Sherman Oaks in now serving Lavazza Coffee from Italy — and to introduce it to their customers they are offering a FREE CUP with any breakfast or lunch entree on July 4 only. If you haven’t tried it, you must…and if you have, you know how good it is. Take A Bao in Studio City (and Century City) has added new additions to its menu for the summer season — Thai Steak and Noodle Salad, Wonton Caesar Salad, Pulled BBQ Pork Bao, Beef and Scallion Pho, Panang Cod, Tempura Crusted Cod and Fries and Broken Fried Rice. 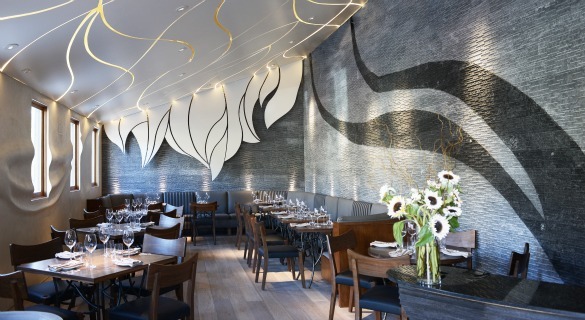 This is not 818-centric, however, this special offer at my personal favorite fine dining restaurant in L.A. is worth noting and definitely worth the drive… the Michelin starred Providence is extending its 8th Anniversary Menu special through July. They are offering a five-course market tasting menu for $80 per person (the menus changes daily). Add a wine pairing for $125 a person. It’s the perfect special occasion restaurant. For reservations, call (323) 460-4170. Thanks Karen! Been waiting for Girasol! Going this week! Thanks, Debbie! Let me know what you think.